(Newser) – Republican Brian Kemp resigned Thursday as Georgia's secretary of state, a day after his campaign said he has enough votes to become Georgia governor, even though his election rival is conceding nothing in one of the nation's marquee midterm races. As the state's top election official, Kemp oversaw the race, and his resignation Thursday morning came as a hearing began for a lawsuit in which five voters asked that he be barred from exercising his duties in any future management of his own election tally. Democratic rival Stacey Abrams' campaign made concerns that Kemp supervised his own election a central issue in the contest. 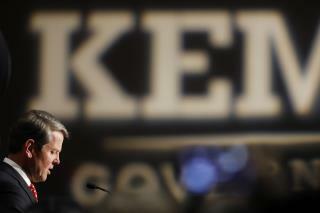 Kemp's resignation takes effect just before noon Thursday, the AP reports. Abrams, who's aiming to become the first black woman elected governor in US history, points to ballots that have yet to be counted and says there's still the possibility of a December runoff. Wonder how many dead people & illegals voted for Stacey Abrams in this Election ! Dead People always vote for Democrats ! If anyone has been keeping track of what has been going on in Georgia they would know that Kemp has been shamelessly kicking all the people he thought would not vote for him off the voting rolls. How sleazy is that? It is because he is part of the old boys club that he was even allowed to do that, Those would be the boys who like to dress in white robes drag. Abrams would be a fool not to ask for a check. Kemp is crooked and so are all the people who support him. Okay, when does the cry of racism come out?